Arik Air is a Nigerian commercial airline founded in 2002. The company slogan is wings of Nigeria. The airline was named West African Airline of the Year in Ghana Aviation Awards 2016. It is the largest airline in Nigeria. Arik Air is owned by Ojemai Investments and the headquarters is located in Lagos. The operational hubs for the airline is the Murtala Muhammed International Airport and Nnamdi Azikiwe International Airport. Arik Air does not have any subsidiary companies. The airline serves 18 domestic and 11 international destinations. These include Luanda, Cotonou, Banjul, Accra, Abuja, Calabar, Port Harcourt, Uyo, Johannesburg, London, Dubai, and New York City. Arik Air is not a member of any airline alliance. It has only recently entered into a partnership with Emirates. Arik Air current fleet includes Airbuses A330-200, A340-500 and Boeings 737-700, 737-800, 748-8i, and 787-9. The fleet also consists of Bormbardiers CRJ900, CRJ 1000 and Dash 8 Q400 totalling to 25 aircrafts. 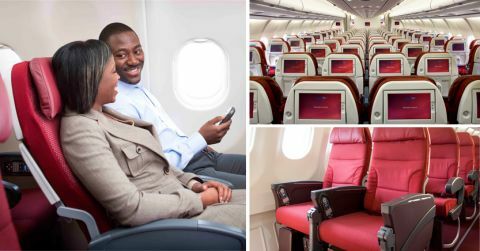 Arik Air offers two cabin configurations for all its aircrafts. These are Business or Premier class and Economy class. Like most major airlines, the Premier class boasts wide seats with massage functions and include delicious signature African cuisine and access to the fully-stocked bar with socialising area. Those in Economy will experience fairly standard service with in-flight entertainment from seat back TV screen. Three-course meals are provided on long-haul flights. Alcoholic beverages are complimentary. Arik Air frequent flyer program is called Arik Affinity Wings. Similar to other loyalty programs, members get to collect miles as they travel within a calendar year. Membership is free and begins at Pearl and go up to Bronze, Silver and Gold as miles are collected and benefits include excess baggage allowance, priority check-in and boarding and access to lounges. Arik Air has just increased its baggage allowance. Economy class passengers can have three bags each weighing up to 23kg. Premier class passengers can have three bags each weighing up to 32kg. How to contact Arik Air?